I used to have a love hate relationship with Carol Danvers. Forged by the heat of battle, imbued with courage and conviction and a diamond hard devotion to loyalty and honour, Captain Marvel commands, and thoroughly deserves, the respect of every other hero who has fought alongside, and with, her. Driven, determined and resourceful and wasn’t reliant on a whole host of female clichés in order to cement her appeal to a predominantly male audience, Carol was always just Carol and that was more than enough. Then Civil War II happened and a previously hidden side of Carol emerged, as fuelled by grief and indecision she began the conflict that nearly tore the superhero community apart. All of a sudden, Carol had become selfish and arrogant; she was difficult and overbearing and became increasingly unlikable. It was almost as if she was going through some sort of internal conflict that was slowly consuming her, and with no answers why her demeanour had changed looming on the horizon, I slowly began to distance myself from, and almost stopped reading, Captain Marvel. And then Margaret Stohl wrote The Life of Captain Marvel and all my nagging issues and questions were answered, everything became clear and I fell in love* with Captain Marvel all over again. 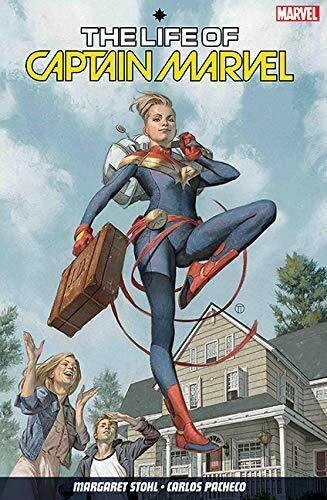 After losing control while taking down a duo of super-villains, in The Life of Captain Marvel , Carol heads home to Maine** for a long overdue break with her family. It’s here in the company of her nearest and dearest, and in the bosom of Carol’s incredibly normal and dysfunctional family dynamic, that Margaret Stohl reimagines and recreates Carol’s personal history and back story, while retaining Captain Marvel’s origin. Told in series of flashbacks following a familial tragedy, Carol suddenly becomes much more human, beset by the same sort of insecurities that we all encounter, her reasons for standing front and centre during the recent superhero war not only become far more apparent, they also become almost understandable. Plagued by a difficult and terse relationship with her father, and the self-doubt and desire to prove herself that it instilled in her, her return to the place she spent her formative years helps Carol, while reconnecting with old friends, battling alien adversaries and discovering a shocking secret about her past and her life, to see the bigger picture and understand that there are often multiple sides to a story and that nothing is rarely as simple as it appears to be. *With the character and all that she represents, not y’know the hearts and flowers variety. **I know Carol’s from Boston, but her family now live in Maine; which is why she heads there.